It’s an impossible task to try to top what The Beatles did with its songs. Fortunately, it’s just as difficult to ruin them completely, especially considering that the band’s compositions are such perfect slices of pop music that they put forth an invitation that most artists simply can’t ignore. 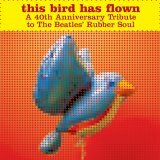 In honor of the 40th anniversary of Rubber Soul, This Bird Has Flown assembles a diverse line-up in order to recreate in its entirety what is arguably The Beatles’ finest effort. For the record, all of the album’s 14 tracks are remarkably well-played, though it certainly isn’t surprising that most of those who were involved in the project took a conservative approach and add merely minor twists to The Beatles’ familiar renditions. For example, Yonder Mountain String Band applied its bluegrass-y style to Think for Yourself’s elastic groove; Dar Williams lent a slight country flavor to You Won’t See Me; and The Donnas' propelled Drive My Car with its no-frills, punk-pop oomph. However, the real fun happens when the material is dramatically reinvented: Ben Harper slips the soulful strains of Michelle into a sensuous reggae groove; Nellie McKay mutates If I Needed Someone into a breezy blast of Brazilian jazz; The Fiery Furnaces submerges Norwegian Wood (This Bird Has Flown) within a kaleidoscopic swirl of keyboards; Cowboy Junkies transforms Run for Your Life into a murderous threat; and newly coronated critics’ darling Sufjan Stevens takes the biggest risk of all by bending What Goes On into an odd concoction that blends the majesty of The Moody Blues with the blues-baked, garage-y grooves of The Kinks as well as the prog-rock of Jethro Tull. Not all of the experimentation works, of course, but it does make This Bird Has Flown more intriguing than most tribute-style compilations.